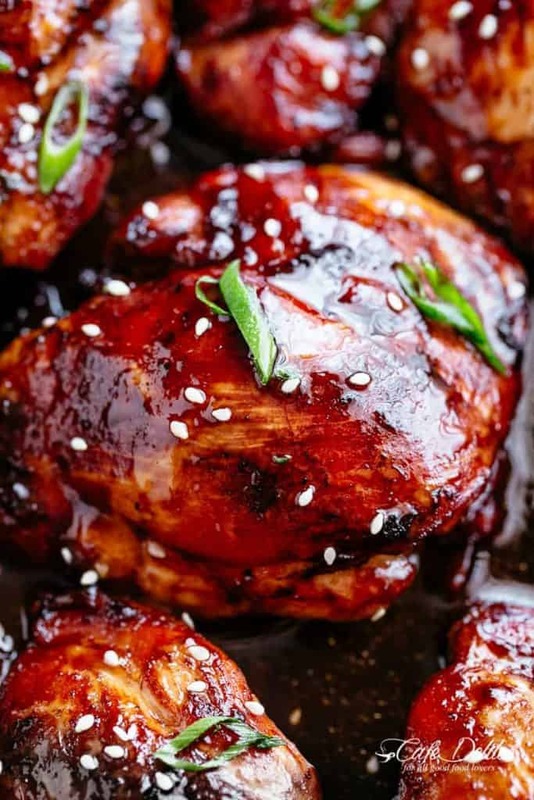 Tender and juicy Honey Soy Baked Chicken Thighs are quick to throw together with only a few ingredients. An easy dinner ready in less than 30 minutes with a mouthwatering honey soy sauce. Boneless and skinless baked chicken thighs are easy to make in one pan. The perfect weeknight or weekend recipe! Most people prefer juicy thigh meat because they are full of flavour, but may not be familiar on how to bake them in the oven. Searing thighs in a skillet is normally the easiest and most popular option, however, thighs are just as easy roasting or baking. 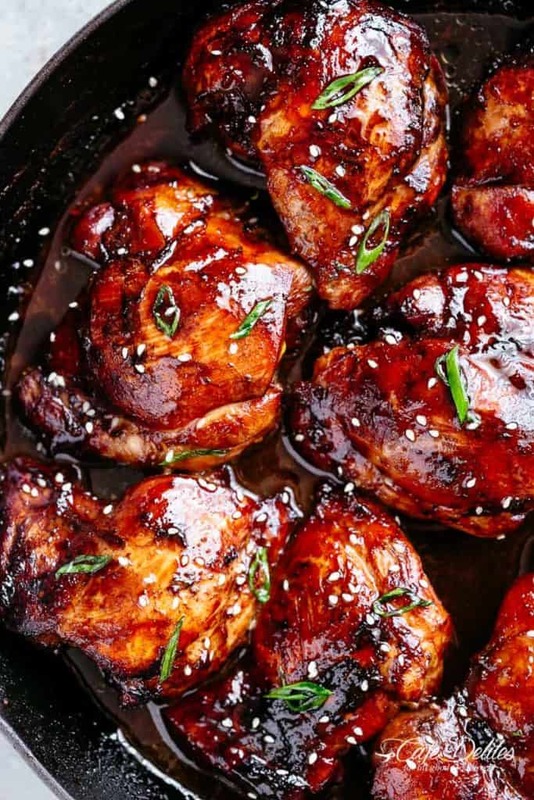 Chicken thighs produce delicious natural pan juices that blend into the sauce while baking. You only need a few minutes of prep time to have juicy tender baked chicken thighs. Let the oven do the work for you! Should I use boneless skinless chicken thighs or bone in with skin? I use boneless skinless chicken thighs for this recipe because they yield the best results. However, you can use bone-in skin-on thighs if you have those on hand. They work just as well with this recipe, but will take about 10 minutes more to cook. Keep an eye on them. As always, you can substitute any ingredient you dislike to make these baked chicken thighs suitable to your taste. 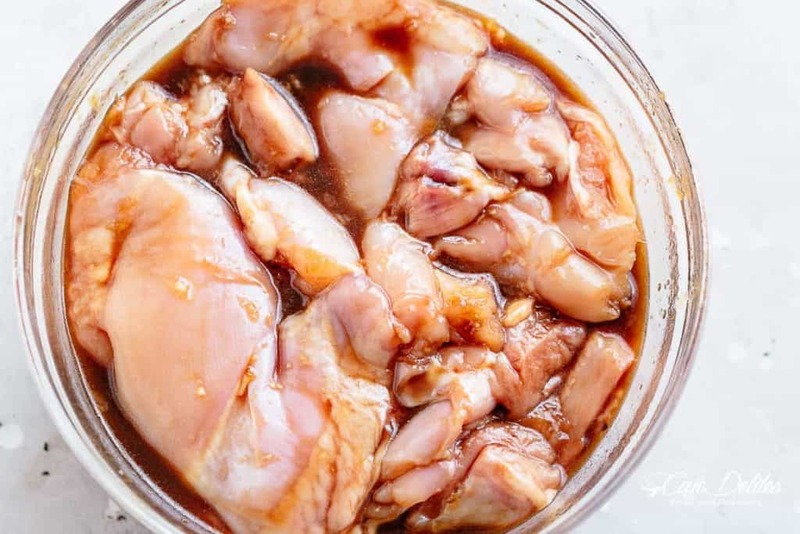 CAN YOU COOK CHICKEN IN ITS MARINADE? Yes you can in this recipe because the marinade cooks together with the baked chicken thighs! You won’t want to stand at your stove after trying our baked chicken thighs recipe! Rinse thighs off first, then pat dry with paper towels before seasoning. Using a cast iron skillet or baking dish to cook them in, arrange chicken thighs in a single layer and pour over the marinade. HOW LONG DO I COOK CHICKEN THIGHS IN THE OVEN AND WHAT TEMPERATURE? Bake boneless skinless thighs at 425°F (or 220°C) for 20-25 minutes, turning them twice while baking to ensure they stay juicy while baking. Lastly, broil under high heat to get charred edges for 5 minutes. Baked chicken thighs should have an internal reading of 165°F (or 70°C). Be sure to check out our Facebook page to see our delicious food videos! 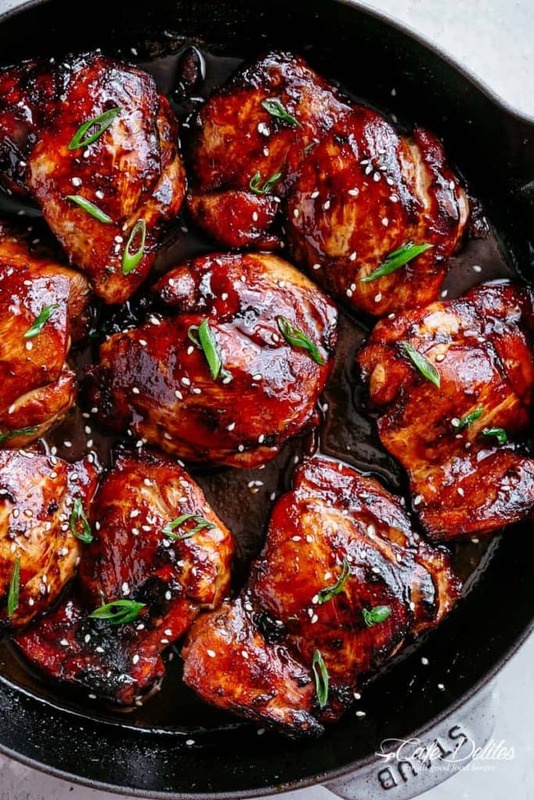 Honey Soy Baked Chicken Thighs are quick to throw together with only a few ingredients, ready in less than 30 minutes. With a mouthwatering honey soy sauce, this is the perfect weeknight or weekend dinner recipe! In a shallow bowl, combine honey, soy sauce, green onions, cooking oil, garlic, vinegar, sesame oil and ginger. Mix well and set aside. Rinse chicken and pat dry with paper towel. Trim off any excess fat. Season with salt and pepper then transfer chicken to the bowl with the marinade. Cover and marinade chicken for at least 30 minutes if time allows (or overnight). Transfer chicken along with the marinade to a cast iron skillet or baking dish. Bake for 20-25 minutes, flipping twice while baking to ensure the chicken doesn’t dry out on top. Broil for 5 minutes at high heat until golden browned and slightly charred on the edges. Chicken should have an internal temp of 165°F (or 70°C). Garnish with parsley and optional sesame seeds. Serve chicken with pan juices over steamed rice, cauliflower rice, zucchini noodles, regular noodles or mashed potatoes.